Angela Davis is a participant in the Indigenous Women of Color Feminist Delegation, civil and women's rights activist, former professor at San Francisco State, UC Berkley and Mills College. She is a founding member of Critical Resistance, a national organization with the mission to dismantle the prison industrial complex. Davis spoke about this complex during the panel Nov. 3 at Jack Adams Hall. Photo by Tearsa Joy Hammock. 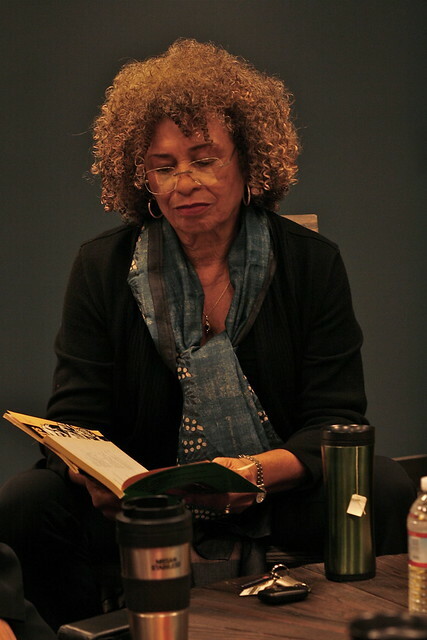 This year’s fourth annual “Palestine and the Indivisibility of Justice” panel hosted a series of notable speakers such as activist, author and scholar, Angela Davis. The celebration of the Palestinian cultural mural situated in Jack Adams Hall took place in honor of Dr. Edward Said and featured a panel of speakers addressing Palestine. Speakers discussed the Israeli occupation of Palestine and the violence and opression that has since ensued. Other speakers included Waziyatawin, Gerald Lenoir, Melissa Garcia, Gina Dent, and Rabab Abdulhadi. SF State senior Lana Abu-Arafeh, long-time member of the General Union of Palestine Students at SF State, felt that mainstream media isn’t doing justice in covering the ever-going conflict between the two groups, and hopes the event can bring more attention to the unjust situation. The speakers touched on topics such as the abstraction and experiences of indigenous people and the possibility of what a free Palestine from Israeli occupation might look like, according to keynote speakers Waziyarawin and Gina Dent, who spoke on these topics. The event not only touched on a variety of issues, but challenged students to include the liberation of Palestine in any other forward-thinking activist agendas they may have. The event also attempted to allow students to understand how connected a student’s personal struggles, such as budget cuts and U.S. economic crisis, is tied together with the entire world as a whole. Some students in attendance already are on the same path of thinking as Abdulhadi and share similar sentiments.